China continues to increase spending to grow its already considerable military, and top Pentagon officials continue to watch the developments carefully. In a report issued this week, the Department of Defense for the first time directly accused China’s military of using cyberattacks to spy on US networks. In this arena and others, “China’s military buildup shows no signs of slowing,” said David Helvey, deputy assistant secretary of Defense for East Asia, who presented the congressionally mandated report on the state of China’s military activities. Here are Pentagon officials’ top four concerns as they carefully monitor the growth of China’s military. 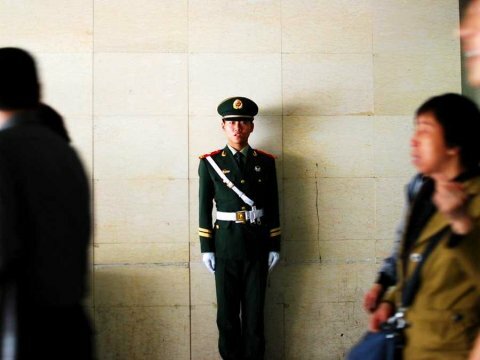 China has long been accused of engaging in cyber attacks and espionage on US networks, but for the first time the US military directly attributed some of those attacks to its counterparts in China, the People’s Liberation Army (PLA). “In 2012, numerous computer systems around the world, including those owned by the United States government, continued to be targeted for intrusions, some of which appear to be attributable directly to the [Chinese] government and military organizations,” Mr. Helvey said during a Pentagon briefing this week. In 2012, China conducted 18 space launches to expand its intelligence and surveillance satellites. At the same time, China is working quickly to “improve its capabilities to limit or prevent the use of space-based assets by adversaries during times of crisis or conflict,” according to the report. China is developing specialized, precision anti-ship ballistic missiles that are capable of hitting US aircraft carriers from a range of about 600 to 1,800 miles, according to the report. “This is something that China has invested in, and we’re watching very carefully as it’s developing that program,” Helvey said. The Chinese military is working quickly to improve its array of increasingly sophisticated fighter jets and attack helicopters. Indeed, China is developing fourth- and fifth-generation aircraft that incorporate stealth technology, some of which, the report says, use technology captured by Chinese spies. China has also launched its first aircraft carrier, which senior US military officials say they are watching carefully and which is “the most significant development in the [Chinese] Navy over the past year,” according to the report. “The formation of carrier battle groups will enable the PLA Navy to conduct comprehensive operations and enhance its long-range operational capabilities,” it says. The PLA is also “investing heavily in a robust program for undersea warfare,” developing nuclear-powered attack submarines, Helvey said. Previous PostCan the Police Take Your Gun(s) During a State of Emergency?